WHAT IS THE NATURE OF THE CONFLICT BETWEEN CHINA AND THE UNITED STATES? We can all see a growing antagonism between China and the United States. One area of conflict is over the use of the US dollar in world trade. Because the US dollar is essential for payments between nations, giving it the status of the world's reserve currency, the US is able to harm other nations by restricting their use of the US dollar for trade. A current example is the way the US wishes to block Iran's sale of oil and gas to China by not allowing its dollars to facilitate such trade. The EU is trying to find a way out of this problem, and both Russia and China are working to set up a financial system which does not depend on the US dollar. When an alternative system has been established the US will have lost one of its important mechanisms for exercising power over the rest of the world. Both sides of this conflict would like us to understand it as a conflict between different kinds of economic systems or different sets of important values. The previous article has explained how what once was a genuine socialist system in China has been changed into a powerful neo-liberal state controlled capitalist system. (1) The only difference is the way that the owners of the means of production relate to the state. 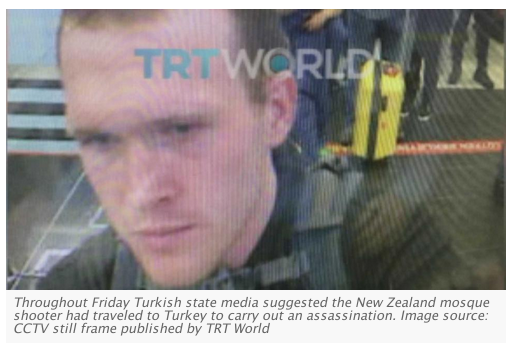 In the West, the owners of the means of production exercise their ownership and control via a web of interconnected banks and large corporations who select and advise the political leaders in the US, UK, the EU, Australia and many other countries. 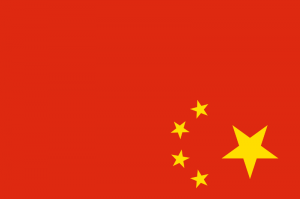 In China the owners of the large corporations are answerable to the leadership of the Communist Party of China which formulates policy and controls the banking system. In a simplified comparison, we can say that in the West the banks control the state, while in China the state controls the banks. Anyone who wishes to believe that this difference constitutes a conflict between the capitalist West and socialist China needs to explain the importance of this difference to the workers in Australia who have seen their jobs disappear in the last few decades. They all know that capitalists cannot resist the urge to move their activities to countries with the lowest wage levels. Socialist countries focus their economies on looking after the people living in that country. People before profits. There are two important ways that the form of neo-liberalism developed in China is different from the neo-liberalism introduced in the West. When the basic doctrines of neo-liberalism were formulated by the members of the Mont Pelerin society in the late 1940s they took the form of two interrelated themes. Both themes were focused on freedom. The early neo-liberals were reacting to to recent phenomena. The first theme was political freedom, and arose from a reaction against the rise of Nazi Germany, Fascist Italy and the socialist USSR, all of which created powerful states to control their populations. This was feared by the political theorists in the West who wished to see a society with much greater personal and political freedom. The second theme was economic freedom. This arose arose from a reaction against Keynsian economics and/or state planned economies which had been adopted by most countries in the world after WWII. In the democratic West, including the US, UK and Western Europe, governments adopted measures such as limiting the power of banks, nationalising industries and concentrating their economic policies on creating full employment. Of course in the USSR and Communist China, there was a much stronger form of state control of the economy. Some of these early neo-liberals even claimed that economic freedom helped create and sustain personal and political freedom. We have seen, however, that economic freedom in the West has brought with it the elimination of both the personal and political freedoms once prized in the West. While a few of the founding fathers of neo-liberalism may have been concerned with personal and political freedom, the real legacy of neo-liberalism in the West today is economic freedom or the “free market”. In fact most sectors of the economy in the West are dominated by cartels. While these are totally at odds with the idea of a “free market”, these cartels are of no more interest to neo-liberals than the powerful snooper states which have developed along side of the cartels. The only economic freedom neo-liberals in the West really care about are “free trade” between countries, where there must be no restrictions on what can be imported into any country, and “free markets” in which there are no restrictions on foreign investment and take-overs. This means large firms can invest in anything anywhere they find profitable and buy out any rivals. The by contrast, the CCP places limits both on Chinese investors and foreign investors in violation of the “free market” principles demanded by neo-liberals in the West. If we step beyond the nearly invisible world of the left – invisible at any rate from the tops of our sky-scraper cathedrals to imperialist success – virtually all investors and market analysts in the mainstream neo-liberal press assume China is a de-facto “market economy”. Othewise, why would they think it was a good place to make a profit? 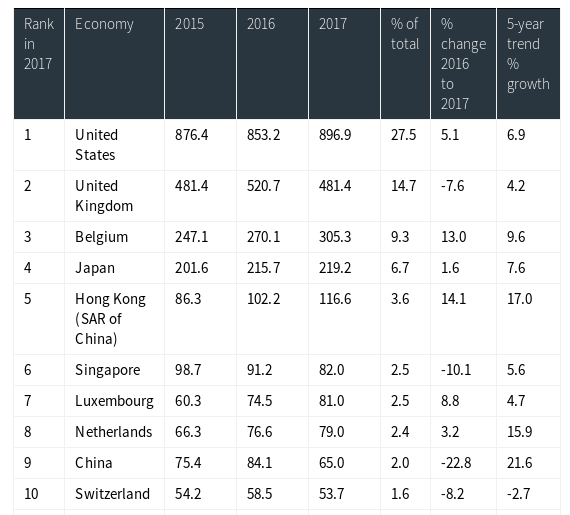 The Forbes article begins with a rather blunt dismissal of the US/EU claims: “China’s status as a 'market economy' is once again under dispute. Not, of course, by anyone who knows anything about the Chinese economy.” For the US and the EU the Chinese economy is not as open as they would like. There are restrictions on access which they don't face in countries like Australia. The basis of the US/EU objection to China joining the WTO is the role of the state in the Chinese economy. In the West, neo-liberals demand the state be small with little or no role in the economy. In practice this means that the giant corporations themselves control the economy and the government. Politicians are “democratically elected” puppets of the largest banks and cartels. In China the Communist Party has gone to great lengths to stop the newly formed capitalist class in China from controlling economic and political decisions. This means that foreign corporations cannot control economic and political decisions either. There is one element of Marxist theory the Chinese have not abandoned: either the state controls large corporations or the large corporations control the state. This is an unstable situation, but the Chinese leadership are all too well aware of the way foreign corporations politically control most countries in the world. Just as the Chinese state is not a typical neo-liberal state, its economy does not follow all of the policies demanded by the neo-liberals in the West. While the state in China is working to minimise its ownership of all enterprises, the CCP still maintains control over major investment decisions and lending by banks. For the neo-liberals in the West this is perhaps the worst economic sin a government can commit. Another difference is that the Chinese state has used a Keynesian strategy to deal with the unemployment caused by disbanding the rural communes and the collapse of many SOEs as they were privatised. Since 1998 the CCP had sought to confront their unemployment problem through debt-financed investments in huge mega-projects to transform physical infrastructures. For neo-liberal economists in the West this is seen as the sin of "deficit spending". China has undertaken very ambitious projects like the Three Gorges Dam to divert water from the Yangtze to the Yellow River. Astonishing rates of urbanization (no fewer than forty-two cities have expanded beyond the 1 million population mark since 1992) require huge investments of fixed capital. Alvin Y. So and Yin-wah Chu give an account of how other neo-liberal policies have been abandoned after 2006. If these policies look like “socialism” to people today, it is only because they were born after the changes forced on the capitalists after WWII were dismantled. Chinese capitalism is adopting the concessions used by capitalists in the West to revive their system at the war's end. “In contrast to the neoliberal doctrine which calls for the dismantling of the welfare state, the Chinese party-state under Hu/Wen leadership has recently presented a new policy of building a new socialist countryside and a harmonious society in 2006 . The above policy is significant because it could signal a change of ideological orientation of the Chinese state. Whereas the pre-2006 Chinese party-state adopted a neoliberal orientation, it is now moving toward a more balanced one between economic growth and social development. While market reforms would continue, this new policy indicates that the state would play a more active role in moderating the negative impacts of marketization. In the new policy, the state will need to include ―the people and environment in its developmental plan, and not just focus narrowly on GNP indicators and economic growth. Noting that China's economy under neo-liberalism has been far more successful than in the West, Alvin Y. So and Yin-wah Chu have concluded that “China has pursued a different mode of neo-liberalism – what we called state neo-liberalism – from the mainstream neo-liberalism that is promoted in the Washington Consensus model.”(5) With state neo-liberalism, the state “interferes” in the economy by controling major investment projects and deficit spending, while adopting all the other neo-liberal policies. 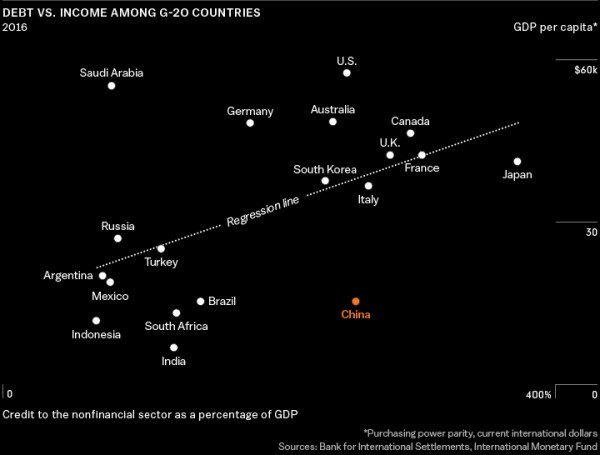 In 2017 the Chinese debt to income (=gross domestic product (GDP)) ratio rose to 266 percent. (7) We can also see that Australia and many of the major NATO countries have debt to income=GDP ratios as large or larger than China. The difference is that while the absolute size of the Chinese debt is small, it has the same size relative to its income as many major Western economies. In contrast, China has the same per capita income as Brazil, South Africa and Indonesia, but has the same debt to income level as the major Western countries. In other words, it is unique in having a low per capita income and a high ratio of debt to income, just as Saudi Arabia is unique with its very high per capita income and its low debt to income level. Some might be tempted to believe that the significant role played by the CCP in the economy show that China is after all socialist. As we saw in the previous article: “A share of stock is merely a title of ownership to a corresponding portion of the surplus-value to be realised by it.”(8) The Chinese state does not own the newly liberated State Owned Enterprises (SOEs). They are owned by their stockholders. Some of the people who own stock in these SOE may be members of the CCP and as individuals have a role in state decisions, but the state itself does not own the means of production. Oddly, much the same situation can be seen in the US today. It is well known that leaders in banking and other sectors of the economy occupy powerful positions in the state apparatus of the US. There is a “revolving door” between the largest companies and the highest offices. Clearly these individuals have almost total control the US government foreign and domestic policy, but the US state does not own these giant corporations. So if anyone thinks the dual role of CCP members in the state economy and the stocks they hold as individuals or families shows China is socialist, they same must be said for the US itself. China's Gini mystery is this: How can a socialist country generate almost two decades (or more) of increasing social inequality? My answer of course is that China has been dismantling its formerly socialist relations of production for the last 40 years. The purpose of neo-liberal policies where ever they are introduced is to concentrate wealth in the hands of those with the most wealth. 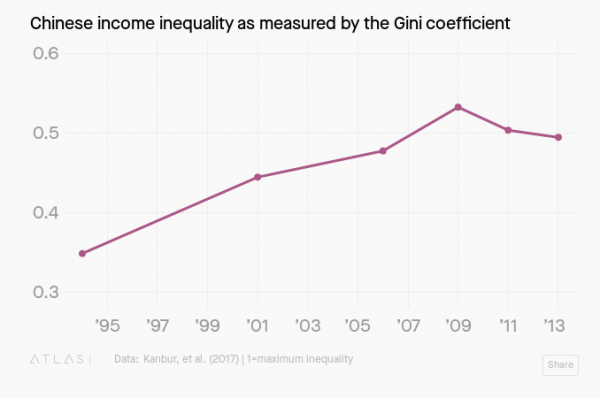 Even in 1994, China's inequality as measured by the Gini coefficient was much better than it is now. It has a long way to go to attain the level of inequality it had 25 years ago. The authors ask “why government policy changed over a 20-year period from allowing inequality to increase to mitigating it.” I would speculate that the CCP realised their neo-liberal policies were producing a level of unrest that might threaten social stability and and with it their rule. This forced them to depart from the hard-line neo-liberal policies they introduced since 1979. The policies explained by Alvin Y. So and Yin-wah Chu in a previous section explain how the growing inequality was reversed. In contrast to the leaders of the CCP, who have broadcast their "reforms" in well publicized policy announcements, the leaders of the developed economies of the West have introduced neo-liberal policies more slowly, carefully and secretly. In this way most of the population fail to appreciate that their current situation has come from many unnoticed changes. These changes have created a class of super-rich who are now on the way to controlling the whole world under the policy of globalisation. This policy removes all national sovereignty and the ability of people to use the power of their government to stop giant banks and corporations from doing anything they want to in pursuit of maximising their profits. This article is one part of four articles on Chinese "Socialism"
8. Karl Marx, Capital, Vol III, Part V, Ch XXIX.